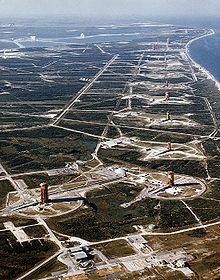 Missile Row was a nickname given in the 1960s to the US Air Force and NASA launch complexes at Cape Canaveral Air Force Station (CCAFS). Operated by the 45th Space Wing of the U.S. Air Force since 1949, it was the site of all pre-Apollo 8 manned launches, as well as many other early Department of Defense (DoD) and NASA launches. For the DoD, it plays a secondary role to Vandenberg AFB in California, but is the launch site for many NASA unmanned space probes, as those spacecraft are typically launched on Air Force launchers. Active launch vehicles are in bold. Much of the support activity for CCAFS occurs at Patrick Air Force Base to the south, its reporting base. Launch Complex 5 Inactive Jupiter, Redstone, Mercury/Redstone. The site of all six manned and unmanned Mercury/Redstone launches. The site of all four manned Mercury/Atlas launches. Launch Complex 19 Inactive Titan I, Gemini/Titan II. The site of all ten manned Gemini/Titan II launches. Launch Complex 31 Inactive Minuteman, Pershing 1a. Launch Complex 34 Inactive Saturn I, Saturn IB. Some of the launch complexes have been recommissioned for modern space vehicle launches. ^ "Launch Complex 29". Air Force Space & Missile Museum. Archived from the original on 2012-04-07. Retrieved 2011-12-15. ^ Gruss, Mike. "SpaceX Leases Florida Launch Pad for Falcon Landings". Spacenews. Retrieved 13 February 2015. This page was last edited on 4 May 2018, at 16:41 (UTC).